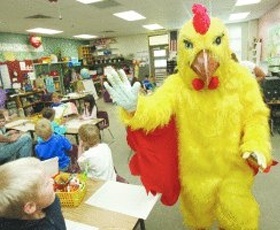 The Le Peep® chicken makes visit to neighborhood schools. Le Peep and each of our Restaurants work to Actively Engage in their Communities. 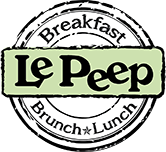 Le Peep restaurants are independently owned by your friends and neighbors in your home town. No big, removed, corporate chain, here! Our owners know the people in their communities, because they are one of them. As such, they are invested in the communities and their citizens. Le Peep actively supports local neighborhood organizations and charities, and we do so with pride in those we share our daily lives with.You support us every time you walk in our doors, and we like to return that support. Thank you for making us a part of your lives- we are honored!